Welcome to NeoMallers.com's newest feature - shop counters! These counters are primarily aimed at mallers, however anyone can still make use of them. Please note, as the name implies, these only work in user shops and only for that user. This means, it will not work in userlookups, petpages, etc. Also, other users won't be able to "steal" your counter either. Visits into your shop from your mall. This will only work if your mall has implemented the &mall code to the end of your links on your mall banner. 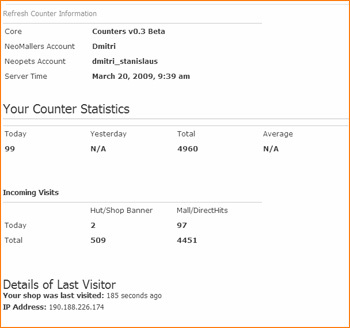 Visits into your shop from your freebies petpages (or whatever other petpage you might have) The counter will use the &petpage code to identify such hits. This is for your personal use (a wild card). If you'd like to track hits from other sources (for instance, a banner on your lookup), add &misc to the end of your links there. Nothing too special except it shows when your shop was last visited.